Note that you must have a PayPal Business Account; you will not be able to use this tool on PayPal Personal Accounts. Only transactions marked by PayPal as Completed, Cleared or Reversed will be imported. Transactions that have been imported using this tool will be ready for processing as per normal bank imports. This means that you will have to process the transactions once they have been imported. In the future, we will be adding in additional functionality to help automate this part of the process as well. 1.1 In AccountsPortal, navigate to the Settings tab and click the Automatic PayPal Imports link. PayPal Email: Enter your registered PayPal Email address. Make sure to type this email address correctly. Account Name: Select the Bank account into which the PayPal transactions will be imported. Group PayPal Fees: Select whether you would like all the PayPal fees to be grouped into a single transaction for each import or not. 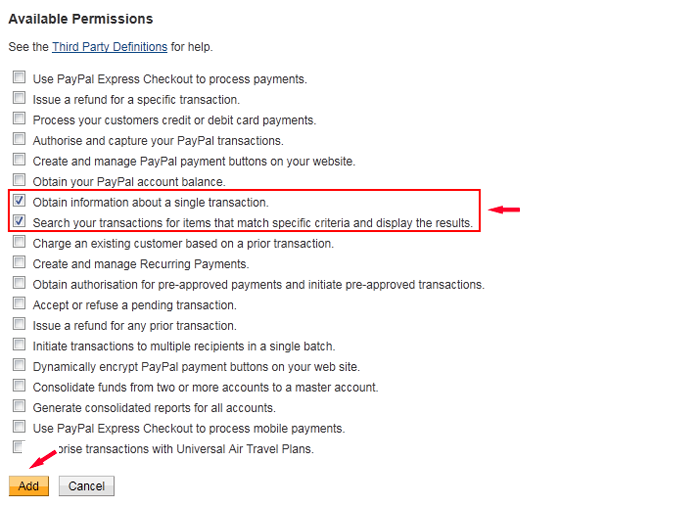 If you do not select this option, then each PayPal fee will be imported as a separate transaction. Enabled: Select this option to enable the imports. If you want to temporarily disable imports, then deselect this option. 1.4 Click the Save button. At this point your Imports will not yet be activated. Please continue with the following steps. Log into your PayPal account and click on the Profile menu link. Select My selling preferences on the left hand side, and then click on the Update button for API Access. Click on the 'Add or edit API permissions' link. 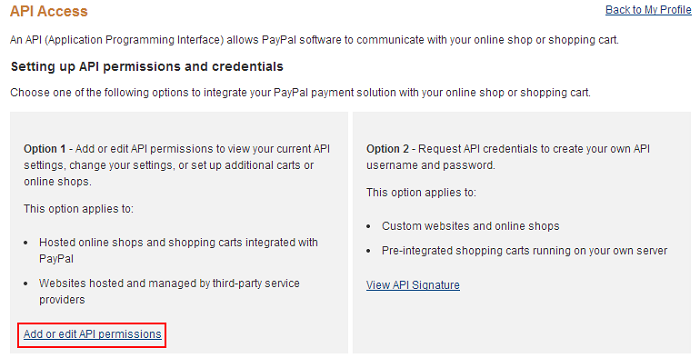 In the API account username field, enter paypal_api1.accountsportal.com. Search your transactions for items that match specific criteria and display the results. The last step is to check your PayPal email address for an activation email - click on the link in this email to complete the integration process. If you have not received an email, then please send an email from your registered PayPal email address to our support ticket desk.